The Redline industrial grade PoE power injector is specifically designed for deployment of RDL-3000 wireless systems in the harsh industrial environment of underserviced, off-grid and isolated locations reliant primarily on reliable DC power. Purpose-built to meet the tough operating conditions in a variety of industrial and public sector applications, Redline’s PoE power-sourcing equipment (PSE) unit supports 12/24/48 VDC power systems. The durable aluminum shell, high quality connectors, and proven electrical design guarantee reliable operation under the most demanding operating conditions. This PoE unit is fully compatible with all Redline RDL-3000 family base stations and terminals. 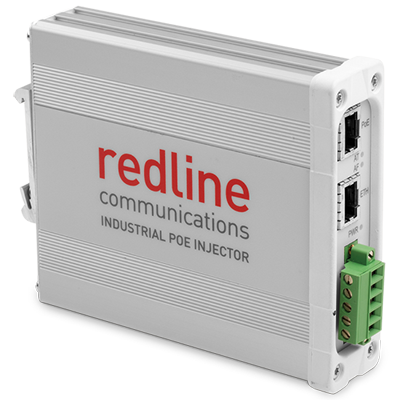 This industrial grade PoE power injector is specifically designed to support deployment of Redline’s high-performance wireless systems in harsh, off-grid industrial environments. The hardened design guarantees sustainable operation under adverse operating conditions including extremely high or low temperatures. Dual inputs accommodate redundant DC power options typical of underserviced and isolated locations that depend on reliable battery- or generator-backed DC power. The PoE injector supports -48 VDC wiring for installation in communications sites.